The Book of Mormon, which follows a pair of Mormon boys on their mission to Uganda , is one of the funniest, most tuneful shows to open on Broadway in quite some time. That’s largely because The Book of Mormon, no matter how you look at it, is classic musical comedy fun. It’s classic in the longer view, as it was clearly constructed with the model of Rodgers and Hammerstein in mind. It’s classic in the medium view, since, like The Producers or Spamalot, it satirizes classic (and current) musical comedy even while it profits from its best lessons. And it’s classic in the short view, since its creative team (Trey Parker, Robert Lopez and Matt Stone) have themselves already contributed to the canon of classic musical comedy, whether in the theatre (Avenue Q, Lopez with Jeff Marx) or on film (South Park: Bigger, Longer and Uncut, Parker and Stone). So where exactly does The Book of Mormon fit in that canon? Well, it’s easily better than the South Park movie, which was often shocking simply to be shocking. There are a few times that a joke in Mormon can feel forced, especially a handful about evil warlord General Buttfucking Naked, but fortunately they’re really set ups for better comic payoffs later on. And its comedy is more raucous than Spamalot, since the creative team isn’t tied down to decades-old routines. But even though it tackles bigger themes than Avenue Q (Q’s urban coming of age story vs. Mormon’s widescreen skewering of religion), it doesn’t dig quite as deep as the earlier show. There’s nothing as profound as Avenue Q’s finale “For Now” here, although the underlying themes of Mormon are very serious indeed, and its conclusions provocative. Still, there’s no denying that the boys have picked the right models, and imitated them well – Mormon is nothing if not well-crafted. 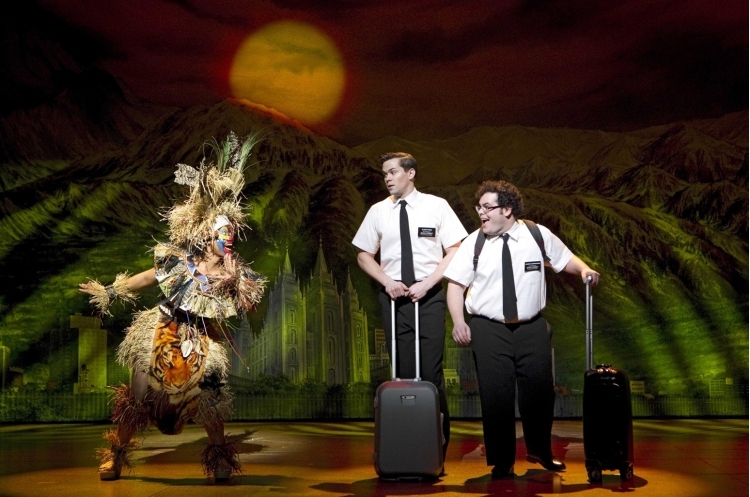 I’m not going to tell you much more about the specifics of The Book of Mormon – as with Avenue Q much of its fun comes from the element of surprise. Since the guys from South Park are part of the equation, you can bet that prudes or the easily offended are not part of the target audience. If you are willing to “go there”, however, Mormon will take you there in belly-laugh inducing musical comedy style.